This quick tutorial is going to show you a really simple photo collage maker application called PhotoCollage. 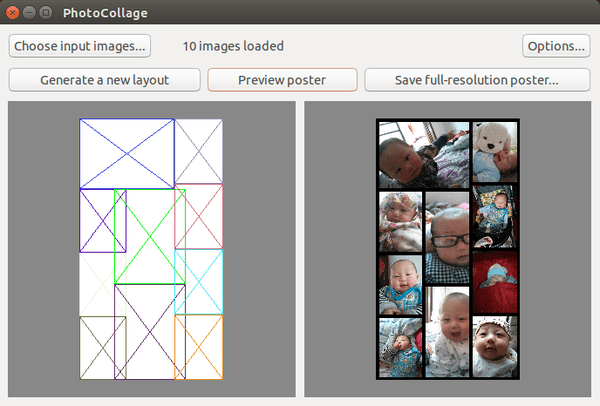 Although Ubuntu has fotowall in its repositories, PhotoCollage make things much easier. Thanks to dhor, the package is also available in his PPA for Ubuntu 14.04. Below commands will add the PPA and install PhotoCollage from that repository. It is funny but poor in settings. I cannot understand how to export to a certain resolution. I’m trying to install Photocollage in Ubuntu 15.05, but get message “unable to locate photocollage” do you have an solutions? I’m trying to install Photocollage in Ubuntu 16.04 and NOT WORK do you have an solutions?